Animal feed is a regulated industry in Canada. Animals at Crimson Lane Farms are fed balanced diets that include vitamins, minerals and grains including corn, oats and soy beans. 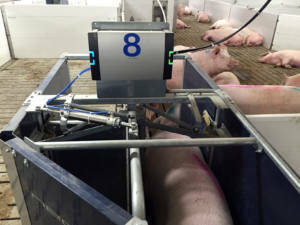 We have implemented an electronic sow feeding system for our group housing design that controls food via a computer. When a sow initially enters the system it records an individual feed program and will set the amount of feed the sow will receive each day, and allows for increases as gestation progresses. The system provides feedback on any sows that fail to eat their allotment each day. This feedback allows us to monitor the nutritional needs of our animals and identify any that may need additional care.